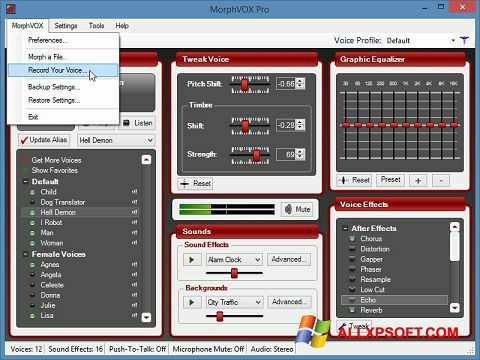 MorphVOX Pro for Windows XP - a tool to change the sound of the voice in real time. The application allows you to create installation profiles with the ability to adjust the equalizer, the effect of duplication, adjust the tone and distortion, allows you to add and combine background noise from a set of sounds. The program includes thematic templates for voice transformation, can record audio with subsequent conversion to mp3 format, work in any messengers and games. The utility is able to run when connecting a microphone, has a modular interface, supports push to talk and download third-party filters. You can free download MorphVOX Pro official latest version for Windows XP in English.